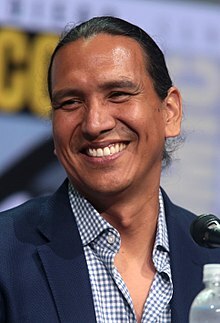 Michael Greyeyes (born June 4, 1967) is a Canadian actor, choreographer, director and educator. He is Plains Cree from the Muskeg Lake First Nation in Saskatchewan. His father was from the Muskeg Lake First Nation and his mother was from the Sweetgrass First Nation, both located in Saskatchewan. He completed his master's degree in Fine Arts at the School of Theatre and Dance at Kent State University and graduated in May 2003. He is a graduate of The National Ballet School in 1984, he went on to apprentice with The National Ballet of Canada before joining the company as a Corps de Ballet member in 1987. After three years, he moved to New York City to join the company of choreographer Eliot Feld. Michael performed in many of Mr. Feld's seminal works including Intermezzo, Skara Brae, and The Jig is Up. He performed in roles created for him in such ballets as Common Ground and Bloom's Wake. Michael's acting career began in 1993 when he was cast as Juh in TNT's Geronimo, which led to numerous television appearances, including guest starring performances in Law & Order: Criminal Intent, Walker, Texas Ranger, Numb3rs, Dr. Quinn, Medicine Woman, Millennium, and in 1998 starred in Stolen Women, Captured Hearts, with Janine Turner and Patrick Bergen. He is featured in the mini-series Klondike, Dreamkeeper, Rough Riders, Big Bear, and True Women. His films include: Dance Me Outside, Smoke Signals, Sunshine State, Skipped Parts, Skinwalkers ( based on the book by Tony Hillerman), and Woman Walks Ahead. Michael continued his dance research on the modern form of traditional dancing, Powwow. His journey of exploration was documented in a documentary entitled He Who Dreams: Michael on the Powwow Trail for CBC Television by Adrienne Clarkson. He choreographed and performed in Rebecca Belmore's durational performance art work Gone Indian for Toronto's Nuit Blanche. He continues to perform regularly. His more recent works include The New World directed by Terence Malick, Tecumseh's Vision a PBS Documentary/ Live Action drama created for PBS, Passchendaele which opened the 2008 Toronto International Film Festival, Untitled #1535 a site-specific dance work he choreographed for Dusk Dances, Triptych (a short film broadcast nationally on Bravo! Television), and The Journey (Pimooteewin), an opera work he directed with music by Melissa Hui and libretto by Tomson Highway. He also did the voice of Tommy in the action game Prey and recently played a recurring role on Fear The Walking Dead. Signal Theater has also produced installations and performance art works, such as Winter Home which premiered in Saskatoon, Saskatchewan. Michael is an Associate Professor of Theatre at York University, and is married to wife, Nancy, and has two daughters, Eva (b. 2002) and Lilia (b. 2004). ^ "Review: A 'Woman Walks Ahead,' and Sitting Bull Stands Up". mobile.nytimes.com. ^ "Jessica Chastain plays the artist who painted Sitting Bull in the inert history lesson 'Woman Walks Ahead'". www.latimes.com. ^ ""Woman Walks Ahead" Finds Jessica Chastain and Sitting Bull Lost on the Plains". www.villagevoice.com. ^ Schilling, Vincent (2017-08-14). "An Extensive Interview With 'Fear The Walking Dead' Star Michael Greyeyes". Indian Country Media Network. Retrieved 2018-01-15. ^ amc (Director). Fear the Walking Dead: 'Michael Greyeyes on Representation' Comic-Con 2017 Panel. Event occurs at 136 seconds. Retrieved 2018-01-15. ^ Citron, Paula (2011-09-20). "Michael Greyeyes: 'I'm not interested in staging ethnicity'". The Globe and Mail (Online ed.). Retrieved 2018-01-15. ^ Crabb, Michael (2014-02-19). "A Soldier's Tale hybrid approach to a harsh wartime tale | Toronto Star". Retrieved 2018-01-15. "Ethnic and Cultural IV: Decolonizing movement: emerging paradigms & reconstruction | Brock University". Retrieved 2018-01-15. Stewart, Amy (2016-03-08). "Performing Indigeneity: Michael Greyeyes directs interdisciplinary Theatre @ York production of THE BIRDS | York Media Relations" (Post secondary institution website). York Media Relations. Retrieved 2018-01-15. Greyeyes, Michael (2008). "He Who Dreams: Reflections on an Indigenous Life in Film | Greyeyes". Theatre Research in Canada | Recherches theatrales au Canada. Theatre Research in Canada / Recherches théâtrales au Canada. 29 (1). Retrieved 2018-01-15. 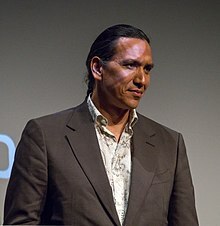 "Michael Greyeyes - PerformanceWiki.ca" (Wikimedia). Performance Wiki by SpiderWebShow. 2015-05-08. Retrieved 2018-01-15.